In an article earlier this month, "Israel's Strategic Incompetence in Gaza," I made three points: that the Israeli leadership unilaterally created its current problems in Gaza, that the war against Hamas meant ignoring the much larger threat of Iranian nuclear weapons, and that the goal of empowering Al-Fatah makes no sense. "Your article was a real downer. Do you have any uppers?" The Middle East is a source of nearly unmitigated bad news these days. Two rare positive developments concern economics: Israel has finally, thanks for the reforms carried out by Binyamin Netanyahu, weaned itself from the debilitating socialism of its earlier years; and the price of energy has gone down by over two-thirds. "Accepting that your opinions are true, the title and tone of the article can only encourage Israel's enemies. More careful language would have been more to Israel's advantage." I try to offer constructive criticism. Even if Israel's enemies do find encouragement in my less-than-boosterish analysis, I expect this is more than offset by my helping Israelis realize their errors. "The enemy of Israel is its traitorous leadership that is intentionally working to destroy the Jewish state and bring upon world Jewry another Holocaust. To refuse to make this clear and to continue to suggest incompetence is the problem, is to enable the leadership and, thus, become a traitor oneself." If one is a traitor to Israel by not seeing its leadership as "intentionally working to destroy the Jewish state, and bring upon world Jewry another Holocaust," then color me guilty. I see the leadership as incompetent but not malign, much less suicidal. "Here's an exit strategy from Gaza: Israel should lease a strip of land from Egypt to be used as a buffer zone." Great idea – except there is zero chance of Cairo agreeing to it. "Your analysis wrongly deals with Israel as an independent actor when the U.S. government has a major role limiting Israeli actions." I addressed and rejected this point with regard to the Gaza withdrawal at "Sharon's Gaza Withdrawal – Made in Washington?" but your assertion is broader than Gaza and deserves a full-scale analysis. My brief reply: The idea that Washington forces bad ideas on an unwilling Jerusalem offers solace, implying as it does that the Israeli leadership knows what to do but cannot do it; unfortunately, it is out of date. Yes, from 1973 to 1993, that was indeed the pattern. Since the Oslo accords, however, the Israel leadership has not just been a willing accomplice of its U.S. counterpart but has often taken the lead - e.g., Oslo itself in 1993, the withdrawal from Lebanon in 2000, the Camp David II meetings in 2000, the Taba negotiations of 2001, and the Gaza withdrawal of 2005. Aaron Lerner sums up this point in "American pressure is not the problem," arguing that "Israeli diplomatic initiatives have been almost without exception carried out with American approval only ex-post," then providing examples. "What if the most efficient elements of Israeli society, the military, were in charge in Israel?" But the Israeli military has been largely in charge since the fundamental reorientation from deterrence to appeasement that took place in 1993 – Rabin, Barak, and Sharon dominated the past 16 years, along with many other ex-generals in the country's public life. In Israel, as around the world, the military tends to absorb the warmed-over leftisms produced by civil society. "This is not the time to look backwards and place blame; rather it is time to move on and fix the problem." Assigning responsibility for mistakes is not just a matter of finger-pointing but crucial if one is not to repeat them. "What must Israel do now? In another column this month, "Solving the `Palestinian Problem'," I endorsed the Jordan-Egypt option, whereby the one former takes over the West Bank and the latter Gaza. "You ask, `Why did Olmert squander this opportunity to confront the relatively trivial danger Hamas presents rather than the existential threat of Iran's nuclear program?' The answer lies in the New York Times article on Jan. 11, `U.S. rejected aid for Israeli raid on Iranian nuclear site,' which explains that the U.S. government prevented Israeli efforts to destroy the facilities at Natanz." The analysis at "Israeli Jets vs. Iranian Nukes" suggests that the Israel Defense Forces does not require U.S. approval to cross Iraq or additional U.S. ordnance to strike Iranian targets. "It is so easy to criticize; do you really think you could do better? If so, why not go to Israel and enter the political life there?" A sports writer need not star on the field before he critique players – and neither must a Middle East analyst climb the slippery pole of Israeli politics before offering strategic analysis. As for the legitimacy of my offering views while living in the United States, see "May an American Comment on Israel?" "What do you think of other alternative plans making the rounds, both of which call for no Palestinian state to be established and for Palestinian Arabs to be paid to leave and resettle in the country of their choosing, other than Israel. The "Israeli Initiative" is by Knesset member Benny Elon and the other is from the Jerusalem Summit, authored by Martin Sherman, a professor at Tel Aviv University." I applaud these efforts at creative thinking. The Elon plan resembles my Jordan-Egypt idea, except it focuses exclusively on Jordan "as the sole legitimate representative of the Palestinians" and involves Israeli sovereignty on the West Bank, something I do not call for. The Jerusalem Summit plans calls for a "generous relocation and resettlement package" for Palestinians to leave the Israeli-controlled areas; I expect this will find few takers. "There are real leaders in Israel. To mention just one – Moshe Feiglin. What about him?" He brings important ideas to the Israeli debate but he is not "at the upper echelons of Israel's political life," as I put it in my article, and so I did not include him in my generalization. "Where is Likud leader Binyamin Netanyahu in all this? Is he not a hawk who is repelled by the thought of giving away Israeli land for ANY reason?" If I voted in Israeli elections, I would vote for him next month. That said, we saw him in action as prime minister between 1996 and 1999 and I judge his tenure a failure (in contrast to his subsequent stint at the finance ministry, which was a success). In particular, I recall his poor performance vis-à-vis Syria (which I uncovered in a 1999 article, "The Road to Damascus: What Netanyahu almost gave away"). Perhaps Netanyahu has matured as a leader but, the old adage, "Fool me once, shame on you. Fool me twice, shame on me," implies Likud might have recruited a fresh face. "Now that General (Ret.) Moshe "Bogie" Ya'alon has entered politics, I believe there is hope for Israel's future." 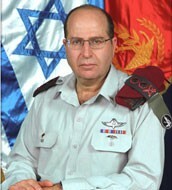 Former IDF chief of General Staff Lt.-Gen. Moshe Ya'alon joined the Likud Party in November 2008. I admire Ya'alon and hope he will have an important post in the next government. He comes as close as any Israeli leader to understanding the country's strategic imperatives. For example, when asked for his definition of victory, Ya'alon replied that it consists of "the very deep internalization by the Palestinians that terrorism and violence will not defeat us, will not make us fold." But, when one looks closely at his main analysis, "Israel and the Palestinians: A New Strategy," Ya'alon does not work to gain such a victory over the Palestinians. Rather, he wants to reform the Palestinian Authority so that it can better control territory, effect law enforcement, strengthen its judicial authority, acquire a democratic spirit, and improve the quality of life of its population. "Economic convalescence, an effective rule of law, and democratization are essential conditions," he writes, "for the rehabilitation of Palestinian society." He concludes that a reorganization of Palestinian society in accordance with his ideas "could feasibly serve as the foundation for a future settlement that would realize some of the hopes that were pinned on the Oslo process." I conclude, therefore, that Ya'alon's goal is not victory but another attempt at Oslo-style compromise and resolution. "What has happened to the Israelis that they no longer fight smart?" Good question. I offered one reply a half-year ago: "The strategically brilliant but economically deficient early state has been replaced by the reverse. Yesteryear's spy masterminds, military geniuses, and political heavyweights have seemingly gone into high tech, leaving the state in the hands of corrupt, short-sighted mental midgets." But this does not explain the whole situation, which results from a deep mix of fatigue and arrogance. The best analyses of this problem are by Yoram Hazony, The Jewish State: The Struggle for Israel's Soul and Kenneth Levin, The Oslo Syndrome: Delusions of a People Under Siege. "Daniel Pipes should try to defuse tensions between Israel and the Arab neighbors." Attempts at defusing tensions have been a central focus since the Kilometer 101 agreement of 1973. They have failed because they try to finesse a decisive conclusion to the Arab-Israeli conflict. I favor a decisive conclusion, for it alone will end the conflict.